So you’re ready to finally take the leap and begin your custom screen printing or embroidery job for your team, business, or school. You’ve searched high and low both nationally online and locally in person, and you think you’ve found the best price. You commit to the order and everything appears to turn out just fine.. until it’s time to pay. It’s true that screen print and embroidery shops large and small have certain setup costs. Some of them pass this cost on to their customers and some of them build it in to the product cost or simply eat the setup costs. What is a screen charge in screen printing? 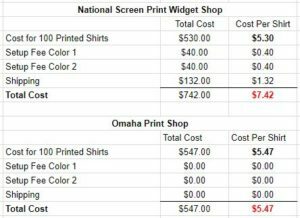 Although the price per shirt started out cheaper at the National company ($5.30 vs. $5.47), after you factor in setup fees and shipping, the Omaha Print Shop is much cheaper ($5.47 vs $7.42). The setup fee has an even larger impact on smaller orders. Imagine ordering just 12 shirts. If you’re paying two $40 setup fees for a two color design, and it’s spread out across just 12 shirts, that adds $5.71 per shirt! What is a digitization fee in embroidery? Similar to a screen charge in screen printing, a digitization fee in embroidery is the fee an embroidery shop charges to setup your art. Art must be converted into a digital format in order for the embroidery machine to understand how to properly sew the thread. Almost every shop charges this fee and it normally ranges between $25 and $50 per order. Depending on thread count and quantity the cost per embroidery design normally ranges from $6 – $9 for small orders. Omaha Print Shop embroiders for only $5 each, with no setup charge and a minimum of only 12!